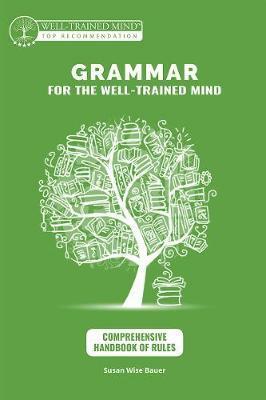 Designed to accompany the Grammar for the Well-Trained Mind program, this Comprehensive Handbook of Rules assembles into one handy reference work all of the principles that govern the English language-from basic definitions ("A noun is the name of a person, place, thing, or idea") through advanced sentence structure and analysis. Each rule is illustrated with examples drawn from great literature, along with classic and contemporary works of science, history, and mathematics. Grammar for the Well-Trained Mind is an innovative program that combines the three essential elements of language learning: understanding and memorizing rules (prescriptive teaching), repeated exposure to examples of how those rules are used (descriptive instruction), and practice using those rules in exercises and in writing (practical experience). Each year, parents and teachers go through the dialogue, rules, and examples in the Core Instructor Text; students follow along in the Student Workbook. This repetition solidifies the concepts, definitions, and examples in the student's mind. There are four Student Workbooks, one for each year. Each Student Workbook contains the same rules and examples-but four completely different sets of exercises and assignments, allowing students to develop a wide-ranging knowledge of how the rules and examples are put to use in writing. Each Student Workbook comes with its own Key, providing not only answers, but also explanations for the parent/instructor, and guidance as to when the answers might be ambiguous (as, in English, they often are). All of the rules covered, along with the repeated examples for each, are assembled for ongoing reference in this Comprehensive Handbook of Rules. Use Grammar for the Well-Trained Mind to teach English grammar thoroughly, effectively, and with confidence-no matter what your background or experience! This Handbook of Rules assembles into one handy manual all of the principles that govern the English language--from basic definitions through advanced sentence structure and analysis. Each rule is illustrated with examples drawn from great literature, along with classic and contemporary works of science, history, and mathematics. The Handbook can be used as a stand-alone reference work, or as part of the Grammar for the Well-Trained Mind series, an innovative program that provides all the grammar skills needed to write and speak with eloquence and confidence. Combine it with our Core Instructor Text and a Student Workbook and Key set to create a full year of powerful learning. The Handbook of Rules will become your indispensable guide to clear, grammatical writing! Susan Wise Bauer is a writer, educator, and historian. Her previous books include the Writing With Ease, Writing With Skill, and Story of the World series from Well-Trained Mind Press, as well as The Well-Trained Mind: A Guide to Classical Education at Home, The Well-Educated Mind: A Guide to the Classical Education You Never Had, Rethinking School, The Story of Western Science: From the Writings of Aristotle to the Big Bang Theory, and the History of the World series, all from W. W. W. Norton. She has a Ph.D. in American Studies from the College of William & Mary in Virginia, as well as an M.A. in seventeenth-century literature and a Master of Divinity in Ancient Near Eastern Languages and Literature. For fifteen years, she taught literature and composition at the College of William and Mary. Aaron Woodard is a Virginia based Designer & Illustrator with experience ranging from small start up companies to larger corporate projects. He received a Bachelor's in Communication Arts (Illustration) from Virginia Commonwealth University and an Associates Degree in Graphic Design from Virginia Western Community College.